A dedicated function fire alarm system includes an elevator recall control and supervisory control unit; where a smoke control panel would be installed to monitor smoke detection used for elevator recall. 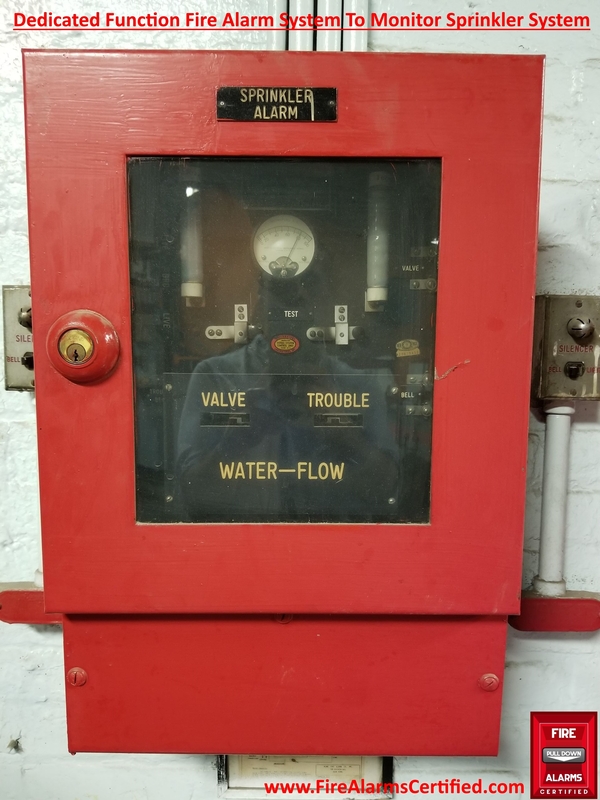 Also, a dedicated function fire alarm system used specifically to monitor sprinkler waterflow and supervisory functions, as pictured below. Mostly these systems are found in older buildings, where previous Building Codes did not require smoke coverage. The image below is a sprinkler control panel installed in a public school. The system was installed to monitor a sprinkler system installed in the basement area of the school. Should the owners of the building decide to install a building fire alarm system, NFPA 72 23.3.3.2.2 requires the newly installed system be interconnected with the (existing) sprinkler control monitoring system and shall comply with the interconnected requirements described in NFPA 72 23.8.2. NFPA 72 23.8.5.5.1 – Where required by other governing laws, codes, or standards to be electronically monitored, waterflow alarm initiating devices shall be connected to a dedicated function fire alarm control unit designated as “sprinkler waterflow and supervisory system” and permanently identified on the control unit and record drawings. Looking for our NICET Fire Alarm System Exam Study Guides?